Hmmm. How should I describe her to you? I write snapshots of all my kids through this blog, but it’s been a little while since I shared a more detailed portrait of any of them. She’s a seven-year-old girl. That probably tells you all you need to know. If you’re not sure what I’m on about, let me spell it out. ‘Seven-year-old girl’ is not only an accurate statement about anyone who is seven and identifies as female, but very often a euphemism for ‘Tiny, loud, feisty human being; ruler of her family; in charge of her brothers; would be capable of handling the Brexit negotiations if shouting and the occasional punch were acceptable’. Oh, and did I mention she doesn’t really do anything that I ask? Oh of course I did, it was in the title. Silly me. It might even have been the very reason you clicked this link. You have a seven-year-old girl too? A feisty seven-year-old boy? A different-aged girl (or boy, or still-working-it-out) who doesn’t give a flying foogle what anyone tells them? Well, hello then. I appear to be in good company. You see, I jest about gender, but really we’re not talking male or female or any particular age. We’re talking about kids who don’t do anything you ask of them. I can no longer imagine what it would be like to have my daughter do something before the fortieth repetition of the request. If this sounds familiar, then grab a cuppa, take a seat, and let me tell you a story to warm your heart and give you something to ponder. You see – I’m not going to tell you what you think I’m going to tell you. You think I’m going to say, “Hey, it’s actually really cool to have a feisty, disobedient child because they’ll be less likely to succumb to peer pressure when they’re older and more likely to know their own mind”, don’t you? Admit it, you thought you knew where this was heading. You’ll be relieved to hear it’s not going anywhere near that clichee of a destination. I have a different insight to share, and it came to me a couple of months ago when I had the pleasure of taking a train journey alone with my girl. Doing something on our own, without the boys, doesn’t happen very often, but we were en route to my sister-in-law’s baby shower and there were strictly No Boys Allowed. Even my father-in-law had been banished from his own home (once he’d cleaned and tidied the downstairs, brought the food in, emptied the dishwasher and put away the laundry, obviously) so that around thirty visiting females could say what they liked about Men without fear of any retribution. The train journey was a couple of hours each way, and we were planning to spend at least five hours there, so – you know – the entire contents of my daughter’s bedroom had to be packed ‘just in case’. When you’re seven, nine hours is a long time. It wasn’t a huge fall, but involved a couple of steps, and with my attempt to catch her resembling an octopus trying to hug a jellyfish (you try negotiating several bags, a baby bouncer, two sets of heels and a child in motion), her leg got a nasty graze. I had no plasters or tissues, and fortunately there was not much blood, but the whole thing put me on edge. I felt stressed and anxious and incredibly guilty – how could I have let my daughter hurt herself on a day out she’d been looking forward to for weeks? When we alighted the train, it was hugely busy and I was anxious about getting on at all. We dived into what I thought was the correct carriage, only to find out, once the train left the station, that it was not. So the two of us, our heels and baby paraphernalia included, pushed (or hobbled) our way down the impossibly-crowded aisle to the ‘right’ carriage. Except it was not the right carriage, because we’d gone the wrong way. Cue repeat of the above, but in the opposite direction and twice as long, having to push our way back to where we’d started, and then on some more to the place where our seats were waiting for us. The rest of the journey passed without incident, but at the end of one of the two train journeys we had to make – I can’t recall which – I mis-timed the station arrival, and we ended up scrabbling to get all our things together and leave the train before it went on to somewhere we didn’t want to go. Again, I felt guilty, knowing for certain that if my quick-thinking daughter hadn’t been on the ball, picking up her things and moving at speed, we’d either have missed the station or left something behind. This girl doesn’t absorb stress. 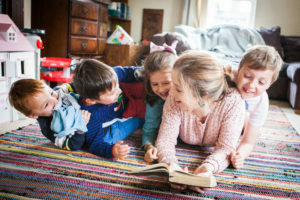 During the various mini-dramas of our journey, my language easily belied the stress I was feeling: the responsibility of being in charge of my daughter away from home, the guilt that I wasn’t doing a very good job, the confusion as to why my parenting skills seemed suddenly to have gone AWOL. It all came out in the language I was using, alternating between obsessively checking my daughter was OK, running a “what if…” narrative, and (I feel ashamed to admit this now) lightly berating my daughter for wearing heels or not being careful enough. But Missy hadn’t absorbed any of this. I felt terrible for screwing up our train journey – but she didn’t even notice. She was having a lovely time, and recovered from each drama almost as soon as it had ended. Some days I feel like I don’t stop nagging Missy, and the more I nag, the more stressed and shouty I become. She drives me crazy for never doing anything she’s asked until the eightieth time – and, boy, does my reaction show it. And I wonder how this nagging will affect her long-term. Will it wear her down? A few months ago I blogged some thoughts on a newspaper report about why so few girls identify as ‘happy’, and it’s something I often find myself mulling over – not just girls, but our kids’ generation in general. My daughter doesn’t do anything I ask – but this means neither does she absorb the stress contained in those requests. Whether it’s the anxiety I express when I nag, the stressful situations I allow to get the better of me, or my own insecurities being triggered through a situation with my kids, Missy is apparently able to drown out the bad noise. While it can be incredibly draining to have a child who persistently ignores requests, I’m grateful that, in doing so, Missy is also ignoring my failings and brokenness. I’m not suggesting that my parenting won’t leave its scars on her, nor that she literally never listens to me, thereby giving me carte blanche to use whatever language I like, but I’m grateful that, so far, she at least seems oblivious to my stress. 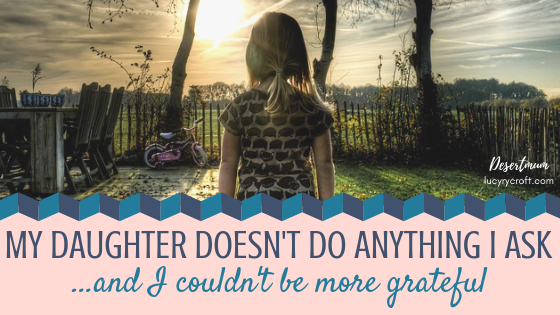 This isn’t a pat-on-the-back parenting moment, because my daughter’s resilience is not something I can take credit for. Nor is this one of those helpful blog posts which gives you three practical tips to implement if your child does absorb your stress. Sorry about that. Instead, I want to encourage those of you who have a child like Missy. As they seemingly allow your words to float over them, doing exactly as they please with no thought for the ticking clock, their own safety, or whatever it is you’re nagging them about, then maybe the stress, anxiety or control that those words contain is also floating away. Oh gosh, I could just picture the scene on the train and feel I should apologize to you for giggling! Sorry! Thank you for making me smile and showing me this massive benefit of that type of personality. F has recently started telling me to ‘chill’ about things I tell him do, and arguing that he doesn’t think they’re anything to worry about. At first I thought he was being really rude, but maybe I could learn to be similarly laid back! So important in our anxious world!